I love making simple seasonal décor for my home, especially for this time of year where there’s a big stretch from 4th of July to Halloween with out a holiday. 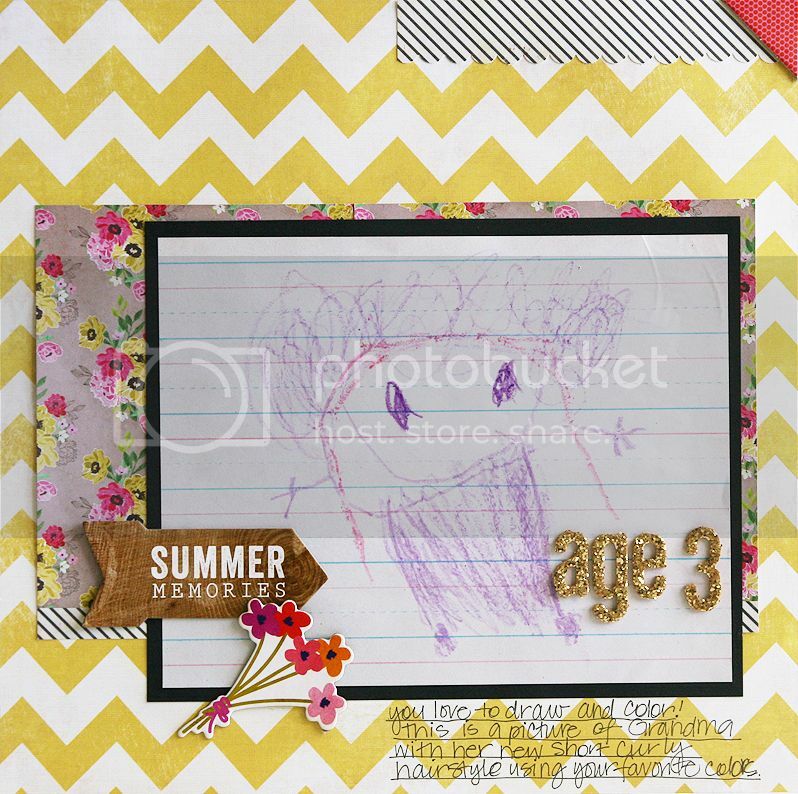 An inexpensive frame can brighten up the mantel or table top your daughter's room after she decides she likes it so much, by adding a photo and a few of your favorite scrapbook papers. 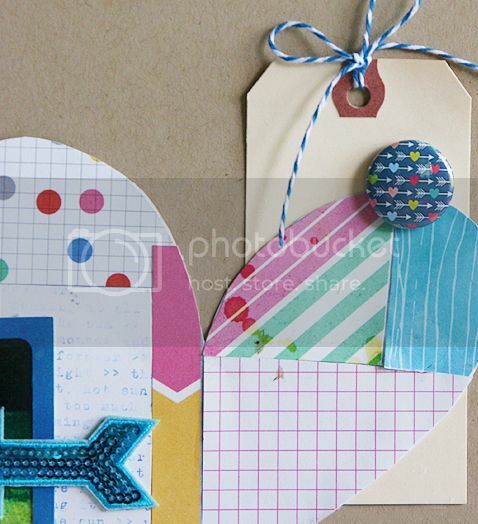 I used 2 patterned papers along with sequins, a flair button and a cut file from the July scrapbook kit. The best part, this can stay up until the jack-o-lanterns come out in the Fall, then I’ll remove this from the frame and add it to one of our summer scrapbook pages! I also made this fun little card using more of the teal sequins and another Paper Bakery flair button from the July kit. For this weeks challenge over on the Pretty Little Studio blog, I pulled a few key elements from this pretty inspiration piece. I love the woodgrain cover of the journal, so to start I used the 12x12 woodgrain paper as the base for my layout. Next I added the strip of polka dot paper to represent the washi tape at the side of the journal, and also added "nature walk" with letters stickers and my Silhouette die-cutting machine. 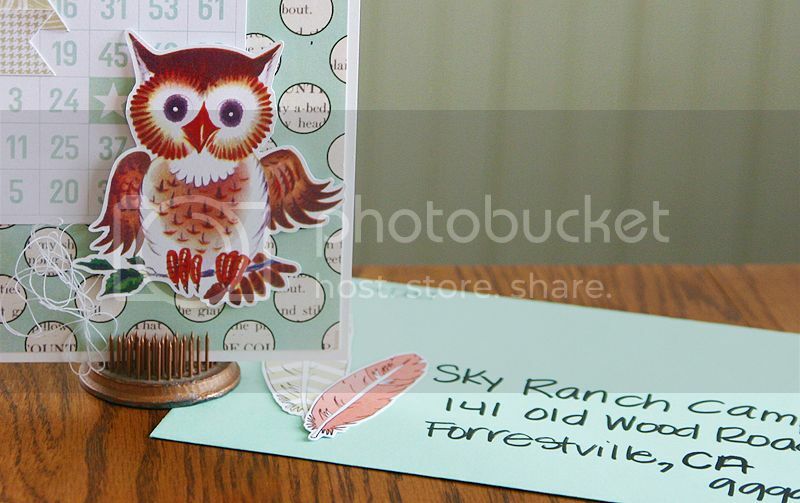 I love the cute little die cut feathers, and even added in a few real feathers too! Thanks for stopping by today, I love when you visit! Today's layout is made using a kit from the Paper Bakery. But not just one kit! I actually used pieces I had left over from the January through June kits. Each month I keep any left over scraps or embellishments from the kits that I don't use, so I thought why not make a layout using all my left overs! From the Echo Park chalkboard paper in June to the arrow cut file from January, I'm happy with this layout of my sweet girl when she was just 5 weeks old. Hi friends! 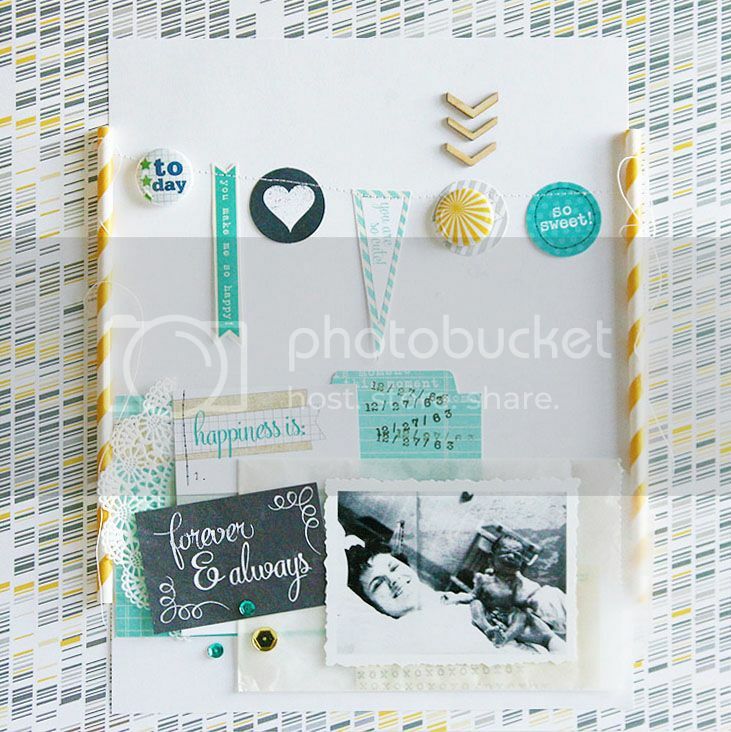 Here's a new layout using the July "Boardwalk" kit from the Paper Bakery. I added the cute Weather Forecast stamp...I love that you can choose from 6 different weather conditions to add. 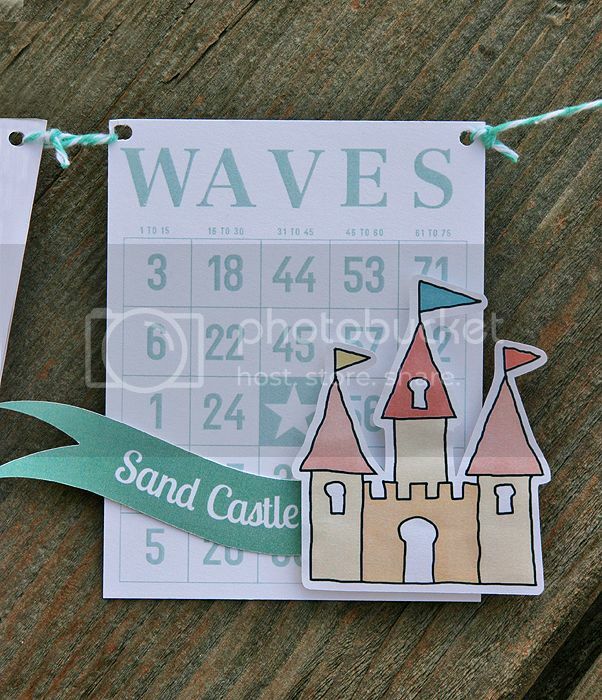 The anchor, waves and Summer Fun title are free cut files this month so be sure to stop by the Paper Bakery blog to grab them, they're on the sidebar! 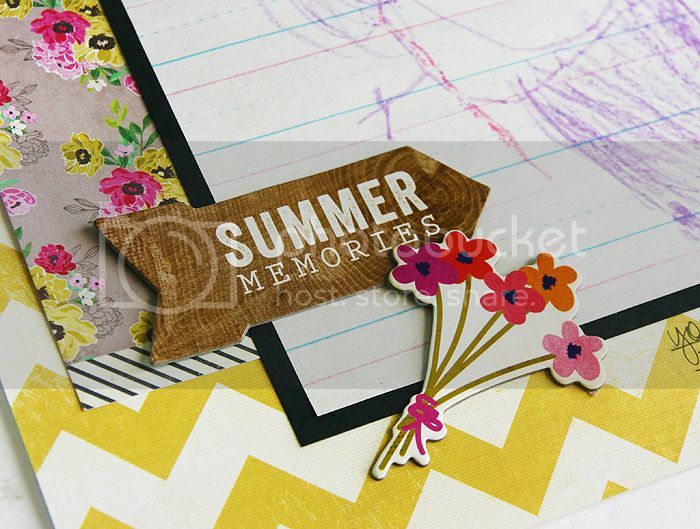 Here's a new layout I made for Scrapbook Daisies, my local scrapbook store using the new "Vintage Summer" collection from Little Yellow Bicycle. Well, the weekend is almost here! Enjoy, and as always, thanks for stopping by! 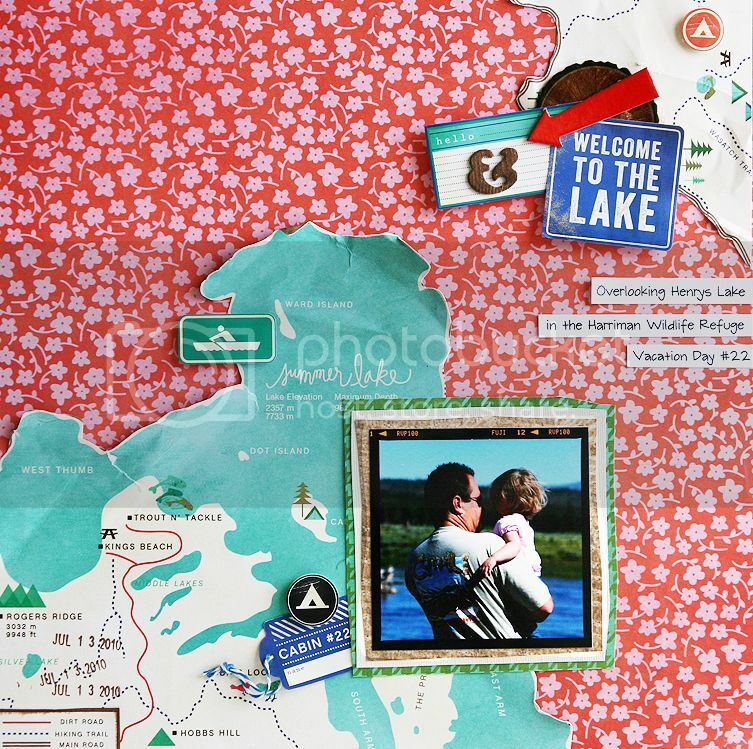 One of the best things about scrapbooking, making a layout just because you love the photo. It wasn't a special occasion, we were waiting in line somewhere, and I was playing with my camera. A moment captured in time. My favorite kind of layout. I used the June scrapbook kit from the Paper Bakery, and layered and wrinkled and roughed up the edges till it looked a bit shabby. Add a little sparkle and a piece of unwoven twine and it's perfect. **Edited to add: Woo-hoo! this is the featured layout today at 2 Peas!!! Hi friends! I have a new layout to share, made with the July kit from the Paper Bakery. 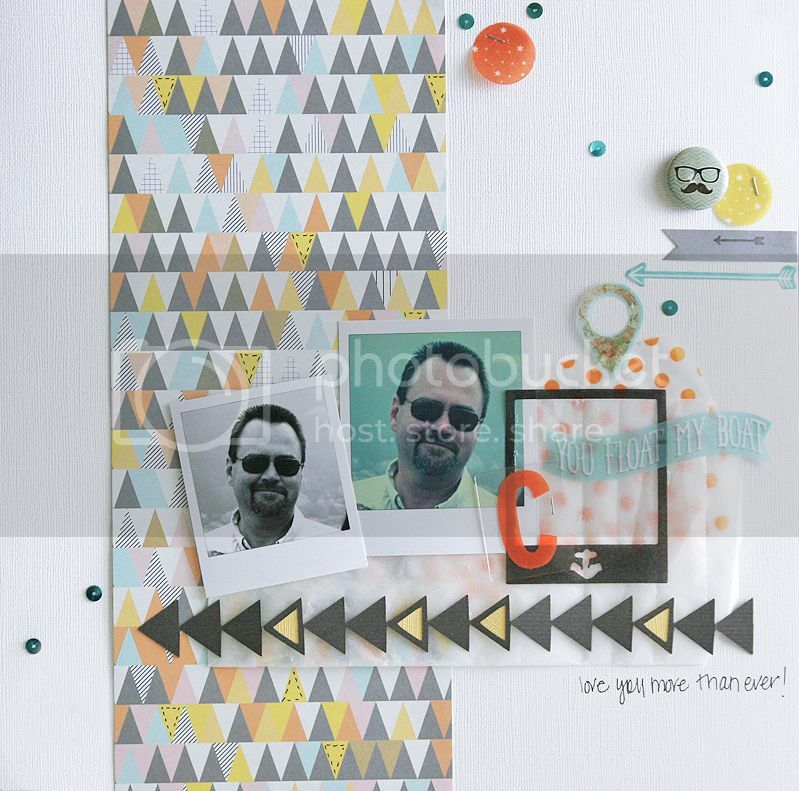 I don't do a whole lot of layouts of just my sweet husband, but that "you float my boat" vellum die-cut was so perfect to use with pics of him! 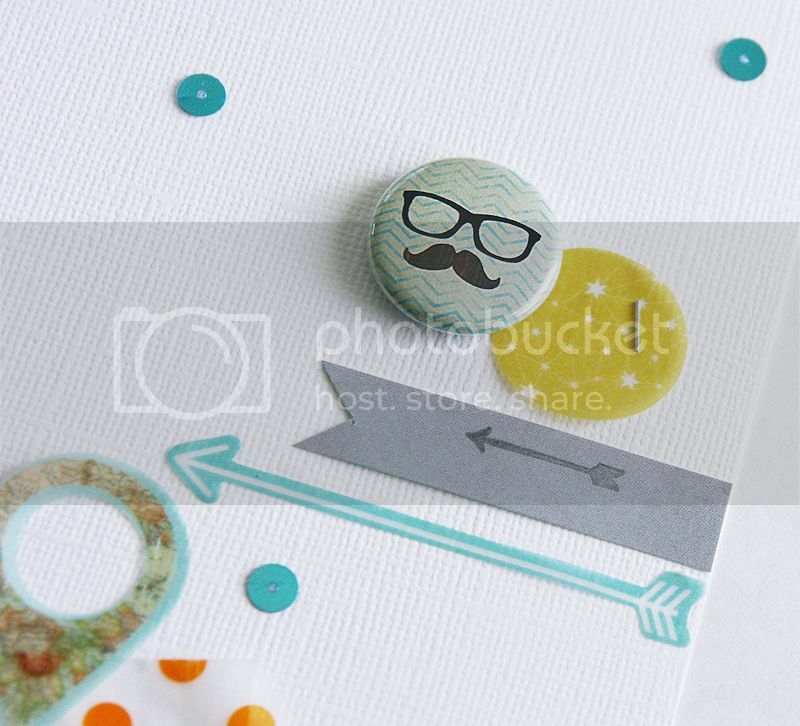 I added in the cute mustache and glasses flair button too!! 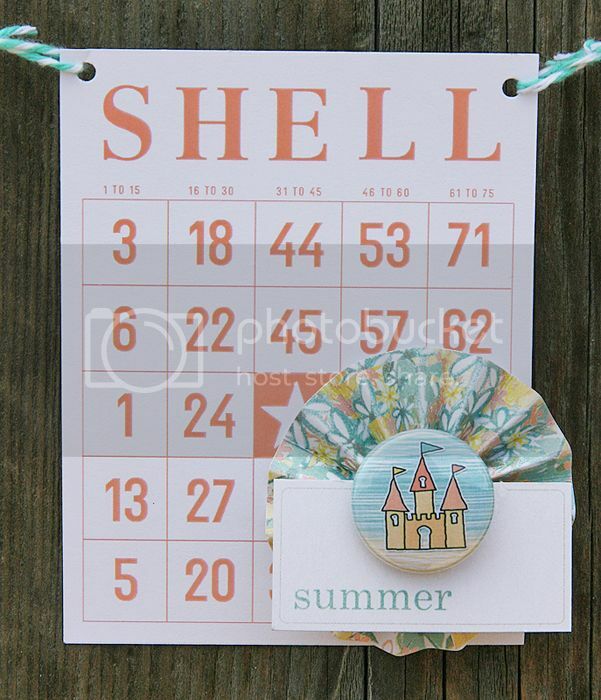 I took down our 4th of July holiday décor today, and replaced it with a summery (is that even a word?) looking display, starting with this cute little banner. 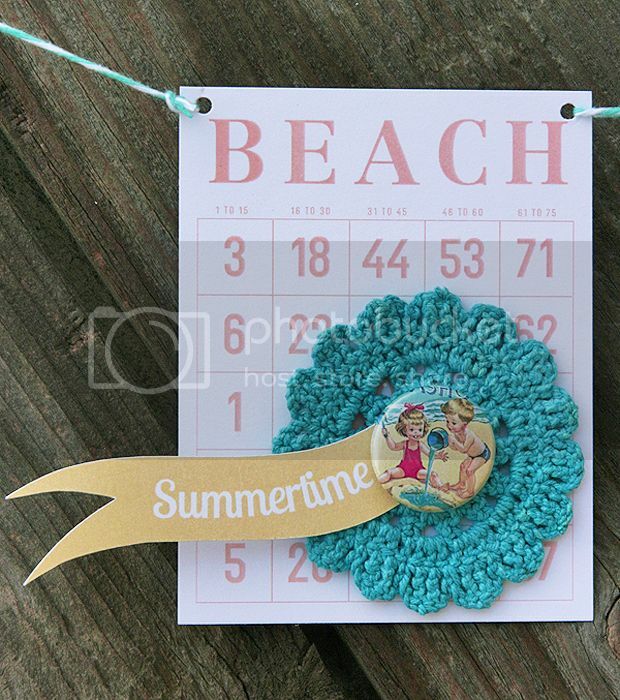 I used the mini beach bingo cards from Pretty Little Studio as the base for each piece, then decorated with a crocheted doily, flair buttons, stickers and banner flags and then tied it all together with a bit of pretty teal bakers twine. 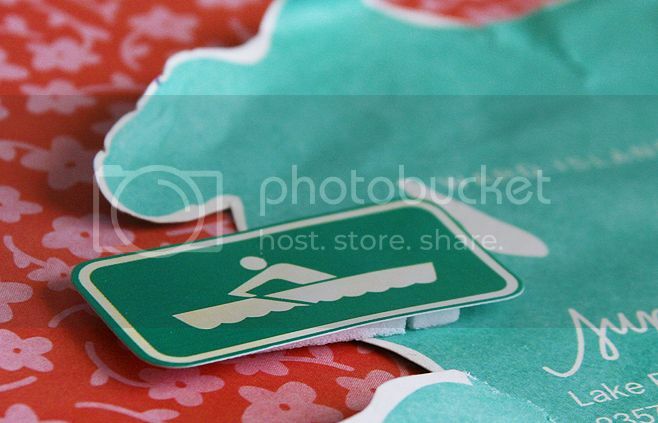 I love the tent and boating stickers that look like the location symbols on a map! I added a layer of foam tape to give them and the cute chipboard pieces a bit of dimension. 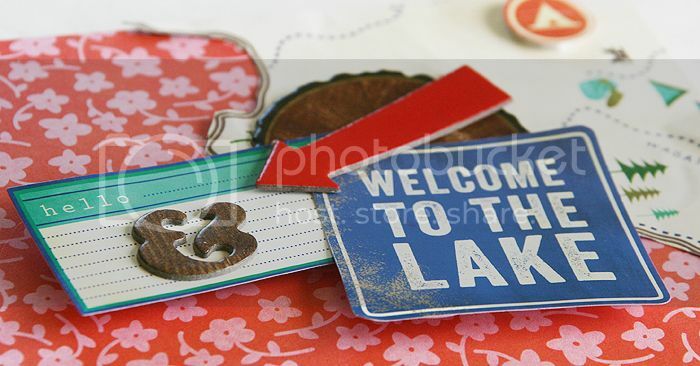 I used a mix of some older Crate Paper and My Minds Eye papers, and more of the cute Lakeside chipboard. I have so many little pictures and drawings my girl has made :) She loves looking through her scrapbooks, and especially likes seeing her artwork mixed in between the pages. Well, July has arrived and so has the warm hot weather. I'd love to crank up the a/c and stay inside and scrapbook, but there are places to see and things to do.